Turns out your trip might have been in the name of science after all. 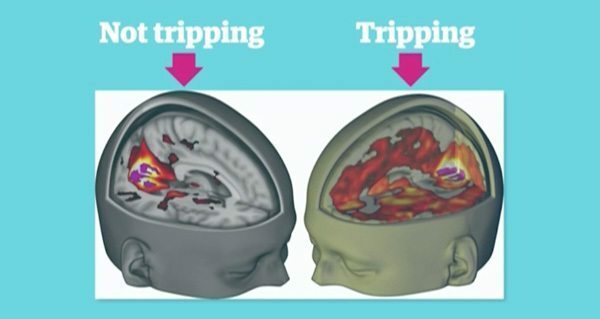 Researchers monitoring the neural activity of participants in a new study recently produced the first images of the effects of LSD on the brain — and the results are pretty impressive. “This is to neuroscience what the Higgs boson was to particle physics,” said David Nutt, professor of neuropsychopharmacology at Imperial College London and senior researcher on the study. brain scans, which showed that their subjects received images from many different regions of the brain, instead of just from the visual cortex (located at the back of head). The brain scans also revealed “decreased connectivity between the parahippocampus and retrosplenial cortex,” which is caused by the temporary loss of an individual identity, otherwise known as ego dissolution. Robin Carhartt-Harris, Nutt’s research partner, believes that there are positive consequences of these emotions. “This experience is sometimes framed in a religious or spiritual way, and seems to be associated with improvements in wellbeing after the drug’s effects have subsided,” he said. Both psychologists and psychiatrists have been studying how a brain functions on LSD since the 1950s, but after it was first banned by California in 1966 (the rest of the country soon followed) any scientific research into the drug’s potential therapeutic uses abruptly ended. Nutt concludes that modeling what happens to the brain on LSD could help treat “pathological states” like depression and addiction. Next, watch what happens to your brain on MDMA. After that, read about these amazing discoveries made while on drugs.